Natural beauty and warm hospitality define the Ayres Lodge Alpine hotel experience. With its casual elegance, Western-style ambiance and beautiful Southern California scenery, our relaxing Alpine hotel offers a refreshing blend of modern luxury and timeless hospitality in San Diego County. Surrounded by mountain horizons and hometown smiles, Ayres Lodge Alpine is a relaxing retreat for a family vacation or business trip. Guests will enjoy a host of complimentary amenities including an extended continental breakfast, parking, and in-room WiFi. Host your business meetings, conferences, banquets and events in beautiful San Diego County. Ayres Lodge Alpine offers 5,500 square feet of dynamic event space at the Alpine Community Center, steps away. Whether you are planning a powerhouse convention for 600 in the Great Room or an intimate cocktail party on the balcony, friends and partners will get inspired in four stylish meeting spaces that reflect our San Diego County culture. Light up your presentations with audiovisual equipment and enhance your business and social events with creative catering. Atmosphere/Decor: Casual elegance, Western-style ambiance and beautiful Southern California scenery. 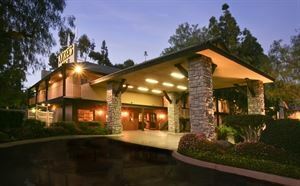 Ayres Lodge Alpine hotel offers a refreshing blend of modern luxury and timeless hospitality in San Diego County.